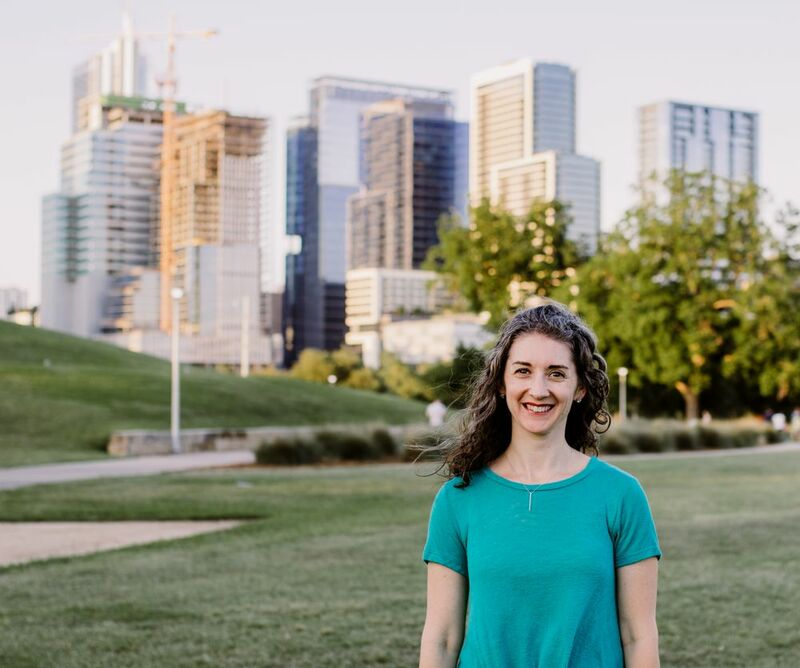 Spring has sprung here in Austin, TX which means many opportunities to play and explore outside with my clients. A favorite activity of ours is water play. I love water play for its simplicity, the ease of getting started, and the fact that it’s very engaging for kids at many different ages. There are many ways to have fun during water play–in the bathtub, using a wading pool, at a water table, or at the kitchen sink. As a traveling SLP, all I need is a tub I can fill up with water and my usual therapy toys. Playing with water is a multi-sensory activity that will also encourage your child to communicate, imagine, experiment, and socialize. You do not have to go out and buy a water table for your child; you can quickly make one from things you already have in the house. First get a large plastic container or a bucket. I prefer a clear plastic bin so your kids can see the water from all angles. Then gather a bunch of household items. Find things that will sink, squirt, or float such as cups, spoons, a turkey baster, spray bottle, sponges, and a funnel. Also, consider grabbing some of the plastic toys you have such as action figures, animals, vehicles, pretend food, and toy dishes. Now you are ready for water play! 1. Play the game sink or float. As you are making your DIY water table, be sure to have some items you know will sink and then some that float. This game is great for targeting predicting. Start by dividing a piece of paper in half and write ‘sink’ on one side and ‘float’ on the other. Then have the child guess or predict what will happen when you place each item in the water. Record your child’s predictions either with words or in pictures. Once all the predictions are made, test it out. 3. Make speech sound practice interesting. 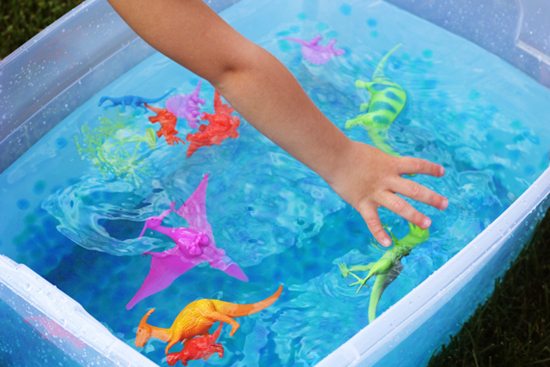 You can use water play to target the sounds your child is working on in speech therapy. Gather items that begin with your child’s target speech sound and place them in the water. For example, if your child is working on /k/ then you could get a cup, car, can, some pretend food (i.e., corn, cookie, candy). Say the words and encourage your child to repeat them after you. You can have your child use their words in a simple sentence like, “I have a cup,” for practice at the phrase level. 4. Help your child make a request. Water play is a fun time to work on simple requesting skills. Hold the desired toy just out of your child’s reach and then wait. Waiting will give your child an opportunity to initiate or make the request on their own. 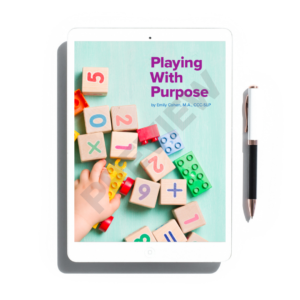 Be mindful of your child’s current level of communication; they may look at you and their desired toy which is an essential form of non-verbal communication. Reward any attempt at communication by giving your child the toy. 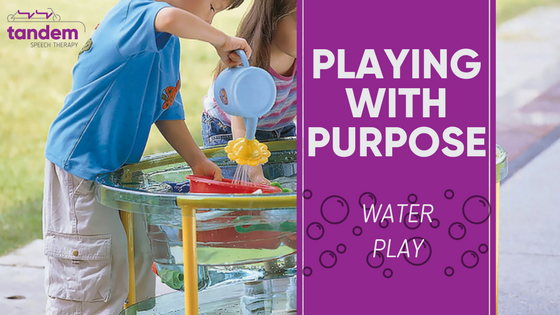 If you’re waiting for them to use a word or an approximation of a word during this water play, you can model the language needed and then pause to see if your child imitates you. Water play will be enjoyable for your kids when you are present in the moment and get down at their level to play. While playing, work in some narration (i.e., “sportscasting”) to add language and vocabulary to the water play time. When you are having fun and participating, your child will be more engaged and likely to stay in this water play interaction with you. The longer you interact with each other, the more opportunities you have to boost and stimulate their language.